Aizawl, Dec 17 : Mizoram Chief Minister Lal Thanhawla today allotted portfolios to his council of ministers who were sworn-in on Saturday. The chief minister retained Political and Cabinet, Vigilance, General Administration Department, Secretariat Administration Department, Department of Personal and Administrative Reforms, Information and Public Relations, PWD, Power and Electricity and District Council Affairs. R. Lalzirliana retained Home and Rural Development and was also allocated Agriculture and Excise and Narcotics, Lalsawta got Finance. 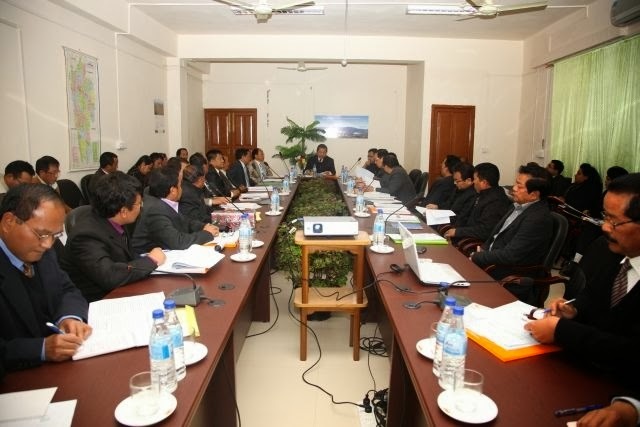 Lalsawta was also allocated Finance, Planning and Programme Implementation, Taxation and Law and Judicial departments. Former speaker R. Romawia was allocated Higher and Technical Education, Art and Culture, Land Revenue and Settlement and Parliamentary Affairs. H. Rohluna was given School Education, Industries (including Geology and Mineral Resources) and Trade and Commerce. Zodintluanga retained his earlier portfolios -- Urban Development and Poverty Alleviation and Sports and Youth Services while he also got Public Health Engineering which was earlier held by S. Hiato, who was defeated. P.C. Lalthanliana, earlier a Minister of State was elevated to the Cabinet and got Horticulture, Local Administration and Social Welfare. Former Deputy Speaker John Rotluangliana got Food, Civil Supplies and Consumer Affairs, Transport and Tourism. Among the Ministers of state - Lal Thanzara was allocated Health, Minor Irrigation and Information and Communication Technology while he would assist the Chief Minister in PWD and Power portfolios. Lalrinmawia Ralte was allocated Environment and Forests, Cooperation, Labour, Employment and Industrial Training and Soil and Water Conservation. C. Ngunlianchunga got A.H. And Veterinary, Disaster Management and Printing and Stationery, while Dr. B.D. Chakma got Sericulture and Fisheries. In the new ministry, former ministers - J.H. Rothuama, P.C. Zoramsangliana, Lalrinliana Sailo and Nihar Kanti Chakma were not included.